At Grow-it-Organically, we use and highly recommend Spring Pots and Fabric Burners for container gardens. For Peppers, Chiles, and Eggplants: 5 or 7-gallon. For Tomatoes: minimum 10-gallon, 15-gallon Better. 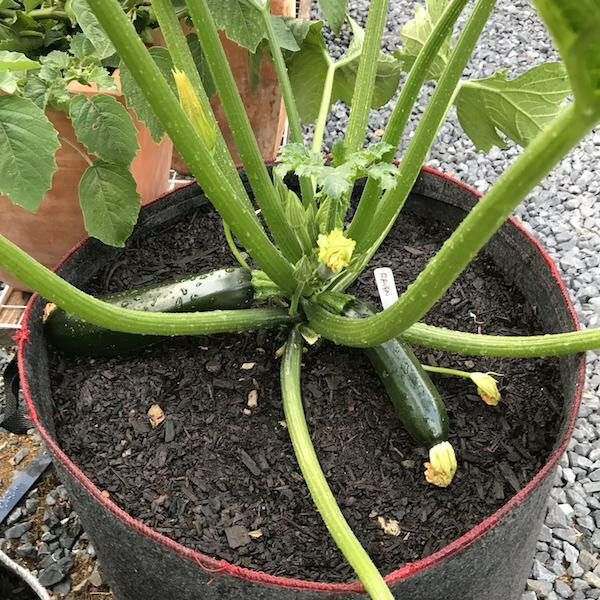 For Squash, Melons, and Cucumbers: 15- or 20-gallon. For Fruit Trees and Fabric Raised Beds: 65-, 100-, 200-, or 300-gallon Sequoia Pots. Spring Pots have a collapsable spring inside the pops up and holds the pot open when released. Fabric Burners don't have springs to hold them open for filling, but their stiff fabric sides still hold them upright. Both work equally well for container gardening, just get the size right for what you're growing and use a good organic potting mix. Use Code "organic10" at checkout for a 10% Discount! See Growing Vegetables in Containers for the full scoop on container gardening. 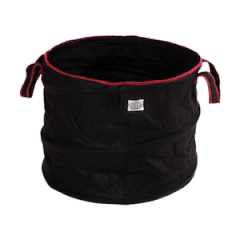 Spring Pots, Fabric Burners, and Sequoia Pots are some of the best fabric pots on the market. Like all fabric pots, when the roots reach the sides of the pot, they "air prune" instead of coiling around the sides of the pot. This produces a healthier, more fibrous root system that's better able to use limited nutrients and resources in a pot. Get 10% off Spring Pots, Fabric Burners, and Sequoia Tree Pots. Use code "organic10" at checkout. Fabric pots are great for deck gardens or wherever weight is an issue, and renters love them because they can just give the soil to a friend, fold the pots, and pack the whole container garden in a box when they have to move. I started using fabric pots in our container garden years ago. We were living in an apartment with a deck garden, and they were ideal because they're lightweight, inexpensive, and much, much easier to move. I used Smart Pots because they were the first ones available, but have been disappointed with their poor durability. The rim above the soil line gets floppy and starts disintegrating after a couple years. They were also harder to fill, because the sides keep flopping toward the center of the pot. You had to fill them by dumping a couple gallons of potting soil into the pot with one hand, holding the sides of the pot open with the other, then spread the soil around to push the sides out. It usually took a couple layers before you could just dump soil in to fill them. Now I use Spring Pots or Fabric Burners instead. Spring Pots have a coiled spring that pops up to hold the sides of the container out, so they're much easier to fill. They also have handles on the sides and a folded and stitched rim, giving them extra strength to keep the rims from getting floppy. Spring Pots hold their shape and are easier to fill, but can still be compressed and fold flat. 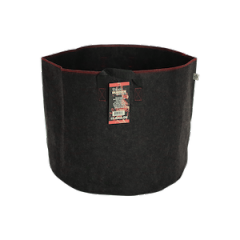 Fabric Burners don't have springs to hold them open, but they're made with stiffer (and better) fabric than Smart Pots, and the folded and stitched rims give them superior stability. I especially like the 15- and 20-gallon Spring Pots and Burners. They're the perfect size for growing zucchini, summer squash, melons, and cucumbers, without taking up prime real estate in raised beds. 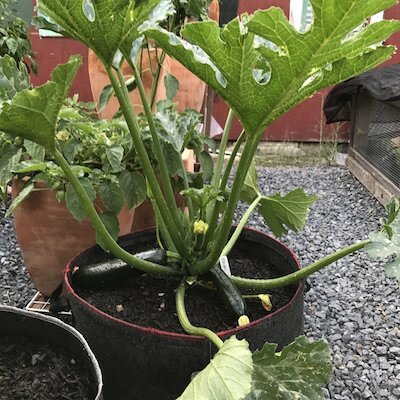 Cucurbits like these can be sprawling space hogs in a raised bed garden, but using 15, 20, or 25-gallon Burners we can grow them around the edges of the garden, wherever there's space to let them sprawl onto terraces and paths. Spring Pots or Fabric Burners work equally well, just get the size right for what you're growing and use a good organic potting mix. Oh, and it's best to grow only ONE plant per pot.